"Revolution is declarative: appeals, addresses, declarations, constitutions, pamphlets, essays, Thoughts, Reflections. Since the end of the eighteenth centure, this is what makes revolution into revolution: distinctive from resistance, transcending reform, a world loudly turned upside down and rearranged." Never in the history of the world has there been an event such as the slave rebellion of 1791 on the island of Haiti—then known as Saint Domingue. The island was colonized by the French during the sixteenth century as Europe set sail to cut up the world into its empire. After two hundred years of prosperity and persecution, the enslaved peoples of Saint Domingue rose up against their oppressors, ultimately driving them out. Yet this driving out of their white oppressors wasn’t a one-time affair. Again and again and again, the people of Haiti have had to stand their ground and fight off the physical and economic advances of their white oppressors. Since establishing independence in 1804, the Haitian government has been persecuted, ignored, undermined, and cast off from by the predominantly white world powers. Yet Haiti has persisted, not because of The United States, The United Kingdom, Spain, France, and others—but in spite of them. The eighteenth century was a time of revolution all throughout the Atlantic. Men rose up, calling for equality. They battled for what they called their “inalienable rights.” Revolutions tore established world powers asunder: the American Revolution, the French Revolution, the Haitian Revolution, and the Spanish American Revolutions. Men demanded equality. Yet, history has shown that the self-evident truth that “all men are created equal,” could very well be revised to “all [white] men are created equal.” However, the spirit of revolution knows no race—and the rights of man pertain to all. It was Jean-Jacques Dessalines who on May 18, 1803 ripped the white from the French tricolor. This served as a symbolic gesture of many layers. The white had been torn out of Haiti. The purpose of this exhibit is to show the racial tension that permeated Haiti before, during, and after its revolution. 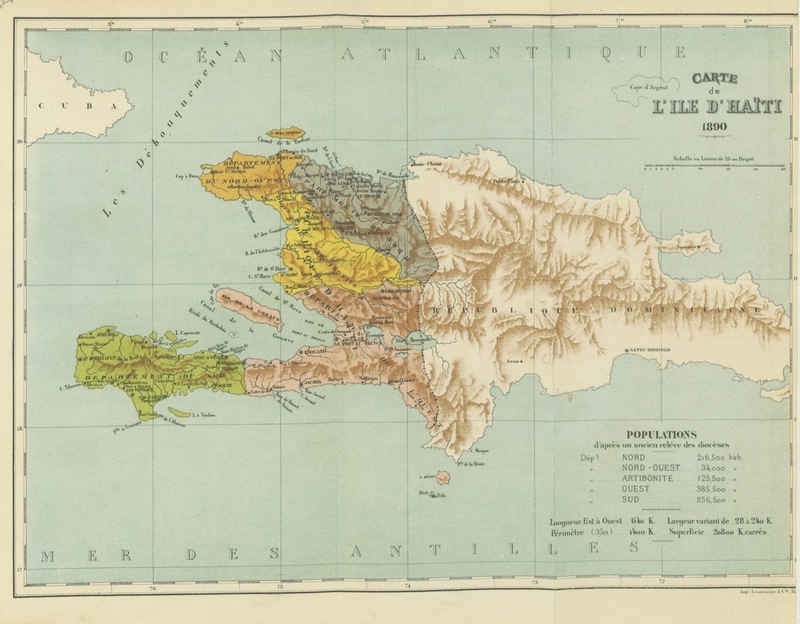 Despite the fact that the enslaved peoples of Haiti accomplished what some would consider impossible, Haiti has still struggled to find its identity and place in the world. It is still largely disparaged today, and in terms of human development, ranks among the world’s lowest countries—all for the same reasons that existed two-hundred years ago. Colonialism created a fractured society with racism so thick that even with two hundred years of cutting, we still haven't hit the quick. The prejudice of the eighteenth century runs deep in the Atlantic, and can still be found, lapping at our shores. Munro, Martin. “Can’t Stand up for Falling Down: Haiti, Its Revolutions, and Twentieth-Century Negritudes.” Research in African Literatures,vol. 35, no. 2, 2004, pp. 1-17. EBSCOhost,dist.lib.usu.edu/login?url=http://search.ebscohost.com/login.aspx?direct=true&db=mzh&AN=2004296541&site=ehost-live. Klooster, Wim. Revolutions in the Atlantic World: a Comparative History. New York University Press, 2018. Sansay, Leonara, and Michael J. Drexler. Secret History or the Horrors of St. Domingo and Laura.Broadview Press, 2008. The British Library. “Image Taken from Page 58 of 'Las Antillas. Cuba, Puerto-Rico, La Martinica, Santo Domingo, Haiti, Jamaica, Guadalupe, San Thomas, Trinidad'.” Flickr, Yahoo!, 1 Dec. 2013, www.flickr.com/photos/britishlibrary/11151594233/in/photolist-hZqQs6-i92B1t-icSNn1-icXkT9-i8QsdG-icU8wF-i8WyDA-i8YSrM-id4vDv-hZr9Zh-hZp9R4-hZygWi-hZUDAn-icUeq5-hZtGJe-i19AVH-hZh2yK-hZp9Ua-hZNABu-i8LKDo-icWMSC-id1AvG-hZqKrh-i6mvd8-hN9p87-hN8MoH-hNazGH-hNhKLe-hNhg1b-hNavKA-qk3J43-hYaGQ1-hXf4TP-hNf7Zp-hNcuyk-hNhnaf-hNd8p6-hNfR3o-hN8QTi-hNhkQF-hNapbJ-hNdXbE-hNet9e-hNbdtM-hNcBUW-hNhgHH-hNi9PE-hNa2eq-hNg7PH-i621Ee. 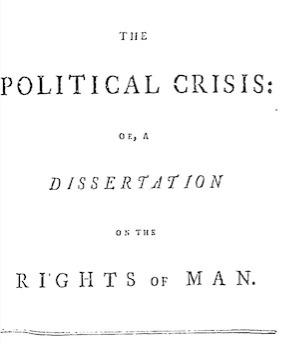 The Political crisis: or, A dissertation on the rights of man. London, MDCCXCI. . Eighteenth Century Collections Online. Gale. UALC Utah State University. 17 Apr. 2018 <http://find.galegroup.com.dist.lib.usu.edu/ecco/infomark.do?&source=gale&prodId=ECCO&userGroupName=utahstate&tabID=T001&docId=CB3326309673&type=multipage&contentSet=ECCOArticles&version=1.0&docLevel=FASCIMILE>.